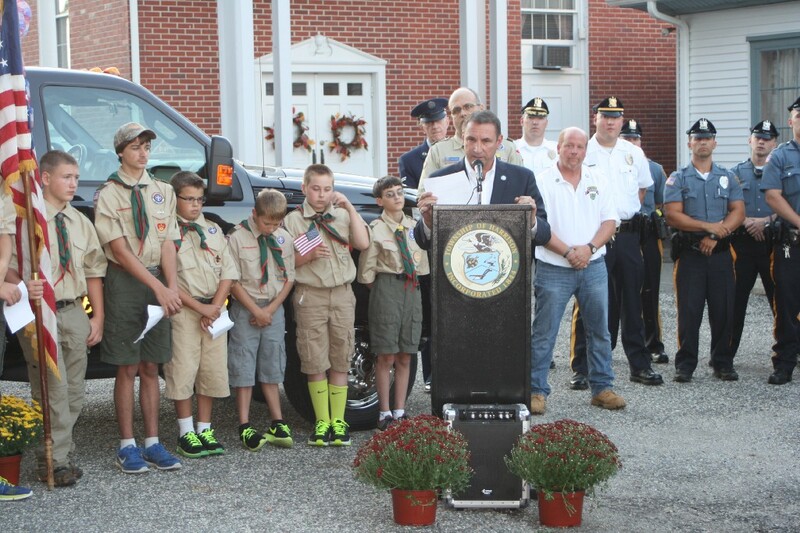 Mayor Louis Manzo is pictured addressing a crowd of first responders and residents last year during Mullica Hill’s 911 ceremony on South Main Street. It seems impossible we just recognized the 16th anniversary of Sept. 11. As always, the nation took pause and ceremonially acknowledged those lost. Gloucester County held their annual Patriot Day Ceremony at the 911 Memorial and Place of Reflection in Chestnut Branch Park. More than two hundred people attended this poignant and beautifully staged event. Gloucester County lost three sons in the World Trade Center that day, so honoring the memory of John Rodak, Nick Brandemarti and Perry Thompson is the focal point of that ceremony. In Harrison, we held a ceremony at William Wilt Park in the evening to display the 911 artifacts our town has obtained in recent years. We also announced our plans to move forward with our permanent 911 Memorial project that will include rocks from the United Flight 93 crash site in Shanksviille, Penn., a concrete slab from the Pentagon and a six-foot piece of box steel from the World Trade Center. The memorial will be complete in time for Sept. 11, 2018. More details on that project’s design and site will follow. We all have our own personal version of that moment when our country, our way of life, was attacked. This year, something strange occurred to me, though. Sixteen years later, we now have an entire generation of Americans who weren’t born yet, or they were too young to have a personal memory of the actual event. For them, Sept. 11, 2001, is like Pearl Harbor…something they read about or watch documentaries on. So, it now falls to us, the parents and grandparents, to shape the written and visual accounts of this historic episode for them and future generations. As always, American resiliency has transformed evil or tragic events into something positive. The fanatical actions of that day are rooted in the perversion of a religion, with its deadly tentacles becoming a global threat in the years since 2001. But, this has energized a rising national spirit here. Instead of a perpetual day of mourning, Sept. 11 is now known as Patriot Day and it symbolizes the courage, strength and character of America. We honor the 3,000 people lost by understanding that 415 of them were first responders in uniform who ran into those burning buildings to save innocent victims. They ran into the towers. The pure gallantry of that is self-evident and jaw-dropping. We are inspired by the heroic actions of the passengers on United Flight 93 that can be summed up in the profound selflessness of two words: “Let’s Roll.” We remember with all its imperfections, America still stands as the beacon of freedom and benevolence to the world. We are like no other culture in human history and Sept. 11 is a day to show our patriotic pride in that distinction and recognize how fragile it is.